Sony Launches Awesome Lens Cameras For Smartphones! I will come out and say it flatly- I am impressed. As far as accessories go for the smartphones, this one comes in top 5 and I have yet to see it in action. So, what is it that Sony has done? 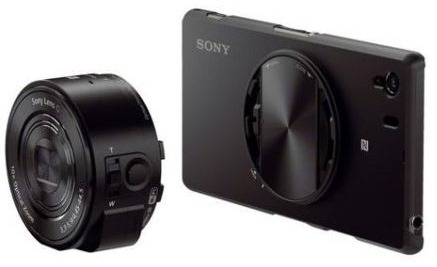 Sony has launched two cameras QX10 and QX100, yes, complete cameras but without a body. Well, the question comes then that how are we supposed to support these cameras and how can they be cameras? The answer to the first is that they can be easily attached to any smartphone and thus turn the smartphone into a powerful camera. Remember! It is not using your phones’ camera and giving it any boost. It has its own lens and the whole apparatus is attached to the phone and the phone merely works as the viewfinder. All the actual work is done by the lens-camera. Also, this means that one actually doesn’t need a smartphone to operate these cameras. They have all the necessary components for the camera to work. These include a lens, battery, memory card and shutter release. Unfortunately though, as it doesn’t have the viewfinder, one cannot know what the photo looks like unless it is seen later. And that is why you need a smartphone. In addition to this, the lens can be connected to the phone wirelessly (WiFi) and will even work from a distance. This would mean that soon we will have people holding a lens in hand while taking a selfie. The lens uses Sony’s Playmemories Mobile app and is available for both Android and iOS. This is great news and gives the product a great selling point. You don’t need to own a Sony phone to use these amazing products. The two products QX10 and QX100 are priced at $250 and $500 respectively. While QX10 is just a mid-range camera, QX100 will actually interest high end users as well. With the portability and lens quality QX100, along with its excellent price might even have a better selling point that its younger sibling. In my opinion, Sony impresses a lot with these two products. I do not know what their future will be but Sony is looking in the right direction. This is one accessory that will sell not because it needs a phone to work with but because it complements the phone completely. Kudos to Sony for this from me! Prices in the UK seem to be £179. I’m strongly considering buying one – I was thinking of getting a compact but I may with this. WOW! WOW! WOW!… am selling my Canon DSLR soon and getting DX 100. Carrying the DSLR bulk has actually become a pain.